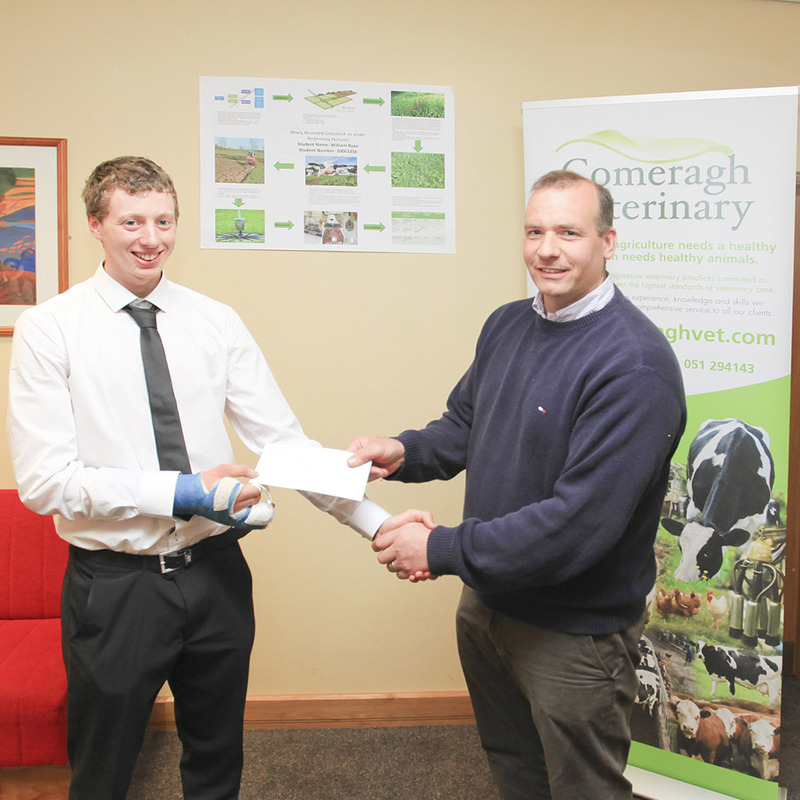 Agriculture students Billy Ryan from Ballycurran in South Kilkenny and John Hannigan from Ballymacarbry in Waterford were the inaugural winners of the Comeragh Vets agricultural projects award at Waterford Institute of Technology (WIT). To be chosen from a 53 strong group, the BSc in Agriculture students presented findings from their third year projects to a panel of judges in Kildalton College in Piltown, Co Kilkenny on Tuesday 26 April. The students created posters with information on a range of topics, such as animal health, grass growth rates, minimum tillage and farm profitability. Billy’s project investigated the value of reseeding grassland, quantifying the benefits over what could be achieved on older, under performing swards. Billy carried out this research at his family farm in South Kilkenny. In a similar project, John examined the factors that affect the growth of grass in the spring on Irish farms. The main variables in this trial were the length of time since the sward was reseeded and the amount of fertiliser applied. Growth rates were measured on farms across Waterford, Tipperary, Kilkenny and Laois, with average daily growth rates and average farm covers being recorded. Chris McGrath and Fiona O’Brien from Comeragh Vet Group which is based in Kilmacthomas were on the judging panel and presented John and Billy with their prizes. “The third year project is an integral part of the course and the students are encouraged to do projects in areas that are of interest to them and will have a real benefit in their future careers. Of course, it’s also a bonus that the skills they gain will stand to them as they continue into fourth year,” course leader Tony Woodcock commented. Agriculture at WIT has become increasingly popular in the last number of years. The course is very practical in its approach and the students divide their time between the main campus and Kildalton College in Piltown Co Kilkenny. Students take production agriculture type modules at Kildalton Agricultural College and more scientific and business related modules are taken at WIT. To accommodate students, a free bus service operates between WIT and Kildalton.